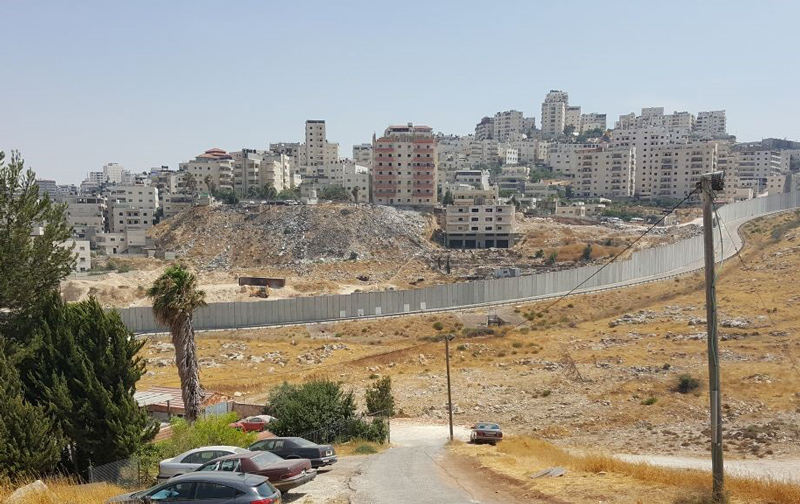 It takes particular gall for European Union representatives to express "humanitarian" outrage at Israel for razing illegal structures in the West Bank -- while the EU is in league with Palestinian criminals who have been brazenly stealing Arab-owned land. There has been massive "behind-the-scenes" Palestinian construction, the goal of which is "to create irreversible facts on the ground," and completely encircle Jerusalem. Once the buildings – which "do not meet even the most minimum standards required by engineers, architects and housing planners" – are erected, the apartments are sold cheaply ($25,000-$50,000), to guarantee they are purchased and populated quickly. If there is any debt to pay here, it is not Israel's to Europe, but the other way around. Belgium and the rest of the EU should be embracing its natural ally, the democratic Jewish state, against all forces that support and perpetrate violence, while rejecting peace. In what is being called an "unprecedented move," eight European countries -- members of an initiative called the West Bank Protection Consortium -- recently announced that they had drafted a formal letter to the Israeli government, demanding the reimbursement of €30,000. According to Belgium, France, Italy, Spain, Sweden, Luxembourg, Ireland and Denmark, this was the sum spent by the Consortium on materials provided for two structures (modular classrooms equipped with solar panels) erected for Palestinians and Bedouin in the West Bank, and dismantled by Israel at the end of August. What these EU countries failed to mention, however, is that the structures were illegal, and therefore should not have been built in the first place. Instead, in its letter, the Consortium accused Israel of causing "suffering to Palestinian civilians," through its "practice of coercive measures such as demolitions and confiscations of humanitarian supplies as well as infrastructure for schools," and of "contradict[ing] Israel's engagement according to the international point of view..."
This is worse than disingenuous. Under the 1993 Oslo Accords, signed on the White House lawn between Israeli Prime Minister Yitzhak Rabin and PLO Chairman Yasser Arafat, in the presence of US President Bill Clinton, Area C of the West Bank is under Israeli military and civil jurisdiction, and only Israel has the authority to build or approve building there. Oslo II, which created the Palestinian Authority (PA), divides the West Bank into three geographical sections – Area A, Area B and Area C -- and specifies which government controls each. Area C is under the military and civil jurisdiction of Israel alone. "Israel retains almost exclusive control over law enforcement, planning and construction in Area C.
"In line with the recommendations of the EU Foreign Affairs Council Conclusions, the European Union works in Area C on two fronts: humanitarian assistance and development. "The EU provides humanitarian assistance to communities in need in Area C in accordance with the humanitarian imperative. At the same time, the EU works with the Palestinian Authority to develop Area C and support Palestinian presence there..."
Yet, for years, there has been non-stop building in Area C, on land between Israel and Jordan as far south as Gush Etzion, in a transparent effort to populate Area C with Arabs by building "irreversible facts on the ground." It is not only Area C, however, that has been in the headlines of late. Area B, which is administered jointly by Israel and the Palestinian Authority, shot into the news again in October, when Israeli Prime Minister Benjamin Netanyahu announced he had decided to postpone a vote on the "Greater Jerusalem" bill, which would expand the Israeli capital's city limits to include nearby settlement blocs. According to sources from Netanyahu's coalition, the legislation would not be advanced before the Netanyahu government had a chance to consult with Washington, which is engaged in efforts to reignite the "stalled" peace process between Israel and the PA.
Ironically, the renewed controversy over Israeli sovereignty coincided with the burgeoning of strategic ties -- in the form of a reconciliation accord -- between the PA's ruling Fatah faction and Hamas, the terrorist organization that has controlled the Gaza Strip since the Palestinian people elected it to do so in 2006. Gaza has also served as Hamas's base for the launching of rockets into Israel, and the origin of hundreds of terror tunnels. The reconciliation accord is currently under serious threat by the refusal of Hamas, to honor its commitment to disarm. The ostensibly problematic nature of legal Israeli construction in the E-1 corridor -- between Jerusalem and Maale Adumim (a large urban settlement included in the Greater Jerusalem bill) -- is based on the false claim, made by the Palestinian Authority and its backers in the international arena, that Jewish presence in that area would prevent territorial "contiguity" and hinder movement within the Palestinian state when it is established. As a result, successive Israeli governments have avoided building in that area. Highlighting the hypocrisy of the world on this issue, in December 2016, Middle East analyst Bassam Tawil noted massive "behind-the-scenes" Palestinian construction, the goal of which is "to create irreversible facts on the ground," and completely encircle Jerusalem. He pointed out that while Israel is condemned for any and every attempt to build housing in the West Bank and Jerusalem, the Palestinian Authority has been undertaking, with impunity, a "colossal" construction project that is "illegal in every respect." Although Tawil referred to this as a "quiet" endeavor, it is actually being carried out in a blatant fashion. 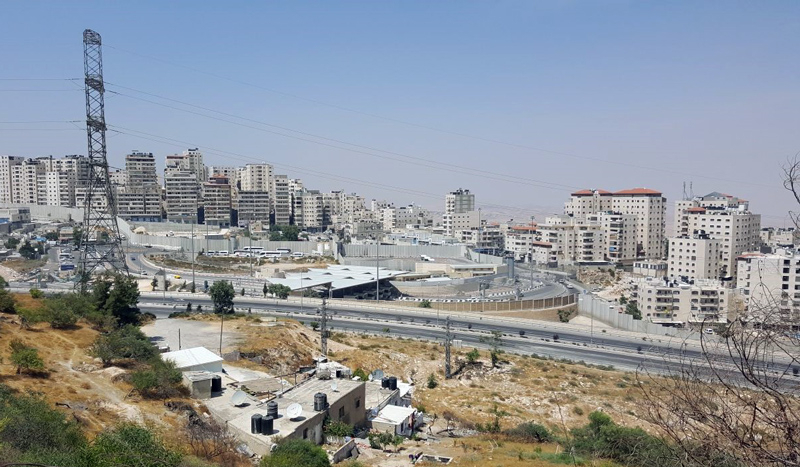 Anyone driving around Arab neighborhoods in the greater Jerusalem can see thousands of apartment buildings in various stages of completion. Many are occupied; others are in the process of being built. Bulldozers and tractors move noisily and freely in broad daylight, digging, hauling debris and moving materials back and forth across lots designated for additional housing, as well as grocery stores, body shops and other consumer outlets. On a recent tour of the area, Arab affairs expert and Jerusalem resident Khaled Abu Toameh explained that this ongoing construction, funded mainly by the EU and Qatar, is made possible through the "confiscation" (theft) of privately owned tracts of Palestinian land by unlicensed contractors whose interest is solely financial. According to Abu Toameh, these "thugs and gangsters" care nothing about the welfare of fellow Palestinians, and are concerned about Palestinian statehood. All they want, he said, is to line their pockets at the expense of helpless landowners, who are told that they must sacrifice their property to help the Palestinian Authority populate the area for political gain against Israel. Illegal Palestinian construction in the Jerusalem area. Once the buildings – which, according to Tawil, "do not meet even the most minimum standards required by engineers, architects and housing planners" -- are erected, the apartments are sold cheaply ($25,000-$50,000), to guarantee they are purchased and populated quickly. On November 12, the Israeli TV network Kan reported that the Jerusalem municipality and Israeli security forces are planning to demolish six such illegal apartment buildings. These are located in the village of Kafr Aqab, within Jerusalem municipal boundaries to the north -- and under Israeli sovereignty -- but outside the security fence. It takes particular gall for European Union representatives to express "humanitarian" outrage at Israel for razing illegal structures in the West Bank -- while the EU is in league with Palestinian criminals who have been brazenly stealing Arab-owned land. It is particularly unfathomable for Belgium -- which spearheaded the demand for Israeli restitution -- to be protesting the removal of modular classrooms, of all things. Less than two weeks earlier, Brussels suspended funding for Palestinian schools, when the monitoring organization Palestinian Media Watch informed the Belgian government that a school it had financed was renamed in honor of a Palestinian terrorist. The female terrorist, Dalal Mughrabi, was responsible for the massacre of 38 people, among them 13 children, near Tel Aviv in 1978. I am a White Christian American. I was born and raised in Milwaukee, Wisconsin, a German-American city, in the Polish-American part of that city. 1. My uncle, up until 1967, owned a meat market in a predominantly Black part of the city. In that year, the Blacks rioted and destroyed his business; he lost everything. Have the Jews in France suffered such things? so has my uncle; and he was not Jewish. "You have a heart condition, don't you?" after which the neighbor punched her in the heart, knocking her down so that she required medical attention. Does this happen to Jews in France? It also happens in America, to non-Jews. 3. I noted that I was raised in a Polish-American neighborhood. That neighborhood is now a Mexican-American neighborhood. Where, you might ask, does my family now live? One of us moved to a neighboring county, with her entire family. The other three of us have moved out of state, to far-flung parts of the continent. Does this happen to Jews in France? It also happens in America, to non-Jews. Times change; people change; people move around; and the rest of us have to move with them. If the Jews in France are having a hard time there, they can stay and complain about it; or they can do what my family did, and move on. I can even recommend a place that they move to: Israel. Khaled Abu Toameh says out loud what a lot of people are thinking. If the voice of Arab reason were led by people like him, there would have been settlement and peace years ago. The many thugs and profiteers in and out of the Palestinian government machine exploit chaos then blame the Israelis and the world is naive enough to fall for it. The longer the Israelis can hold out against this pernicious evil the safer the poor and huddled Palestinian masses will be. Israel will not receive a shred of fairness from the UN or EU. Both UN and EU have been cowered into submission on their theory of throwing Israel to the predators in order that they, the UN-EU cowards, can be the last to be devoured by the Muslims. Obviously, the EU has surrendered to Islam's will and would sell-out any entity to sustain its sell-out status. It gambles with its own future and that of west Europe in a strategy destined to fail. As for the UN, it is weighted by Islam-dominated membership and this issue has been a fact since early in the inception of the UN. The only way the UN will understand its weakness is when the USA decides to abdicate its 20%+ financial support to the UN and close it down in the U.S.A. Yet again this is a clear demonstration of a number very dangerous aspects of the EU. 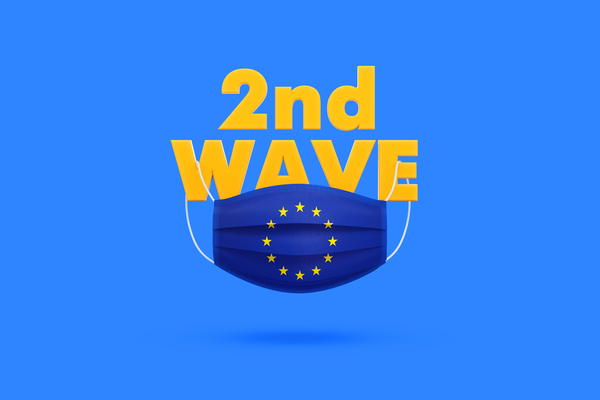 Firstly, the EU is more & more trying to assert itself as a one nation state, two it is clear that the EU is very much in the hands of the misguided liberal elite who in real terms are anti-Israeli which means anti-Jewish, three they have caused the divide between Russia & the west by pushing the boarders hard up against the Russian one. They clearly do not learn from history & Russian history & forth the EU is trying to act as a European superpower the trouble is if it comes to a shooting war they will look to the USA to bail them out as European defences aren't exactly armed to that level of combat efficiency. And there is no point counting on Britain as the Tory government (the so called party of defence JOKE) has absolutely decimated our capability to fight. The army is now smaller then in the time of Oliver Cromwell, the navy can't afford spares to keep our ship afloat, the aircraft carriers have no aircraft & the RAF will probably have bring out any thing that can fly I.e. Spitfires & Hurricanes. No the EU is playing a very dangerous game for which we all could end up paying a very heavy price. Excellent articles which shows that in politics as elsewhere when a party lets go its rights on a small issue it will lose everything. Israel's "leaders" those inefficient clowns taking the nation down the cliff should claim sovereignty over J+S+G and expel the FAKE palestinians and genuine jordanians over to jordan and sinai and not wait until President Trump comes up with any "plan" for Israel since this is none of his nor anyone's business. He will have to adapt his "plan" to Israel's thereafter.